Spotlight | Second weekend in September saw the inaugural Delta Dirt Jam at the Cox Ranch in Clarksburg, California. Organized by Terry and Allison Cox of College Cyclery in Sacramento, the event featured rides and contests Friday through Sunday. There was a midway of venders, an indoor pump track in a big, open-sided barn, a large jump track and an area, like a skateboard park, made out of dirt for bikes, that covered an acre or two of land with jumps and whoops all over the place. Next door, on the grounds of the Portuguese Hall, there was a camping area. A large number of people had campers and tents set up, giving the event a real communal feel. Friday night there was a whip contest. This is a contest run over a series of big jumps where the goal is to throw big tricks in the air: spins, no-handers, tabletops, etc. As this was a slightly informal event, sort of a warmup if you will, and in the spirit of sportsmanship, there were no judges. The contestants chose the winner. All the contestants blew minds but there was a clear consensus on the winner. 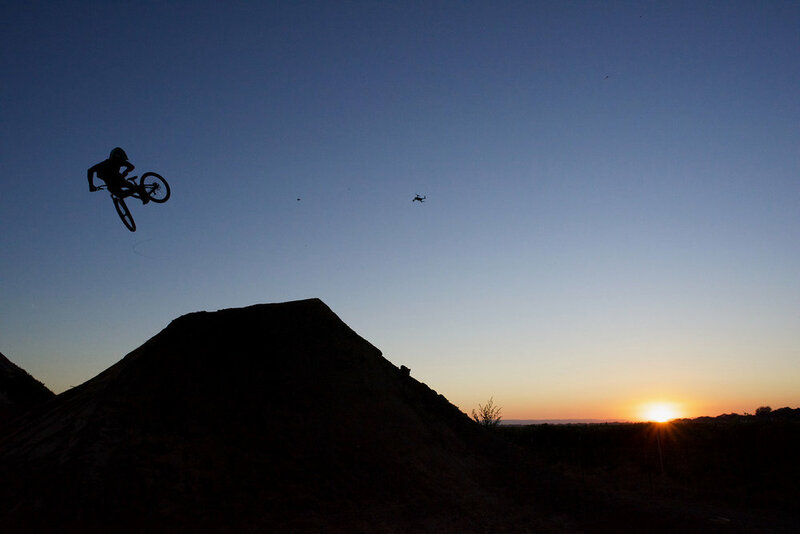 The riders rode full-suspension mountain bikes and the jumps were big: the first jump over 20 feet. Riders came off a two-story launch ramp onto the first and biggest jump, which was set up to throw them 90 degrees to the right and into a series of three jumps along a tree line. As they cleared the jumps and rose in the air, they soared through the leaves of the poplar trees in the golden light. It was really quite a visual treat with the setting sun and the azure sky. Underneath, the jumps were like ancient mounds or large-scale sculpture. Everyone present was struck by the visual power of the moment, and the riders continued to dive off the launch ramp and into the darkening sky long after the sun had set. There is a sort of gunfighter attitude about these riders. They are doing something dangerous and beautiful and they know it. In the end, in the dark, Cody Gessel, 26, from Salt Lake City was the winner. He is a smiling fellow with long, blond hair, a bit taller than some riders, and a jungle hat tied to his belt as he took his runs. The first Delta Dirt Jam made a good impression Friday night. Cox has big plans for the event in the next few years. He is hoping to have it be a celebration of all things two wheels: gasoline, electric and human-powered.